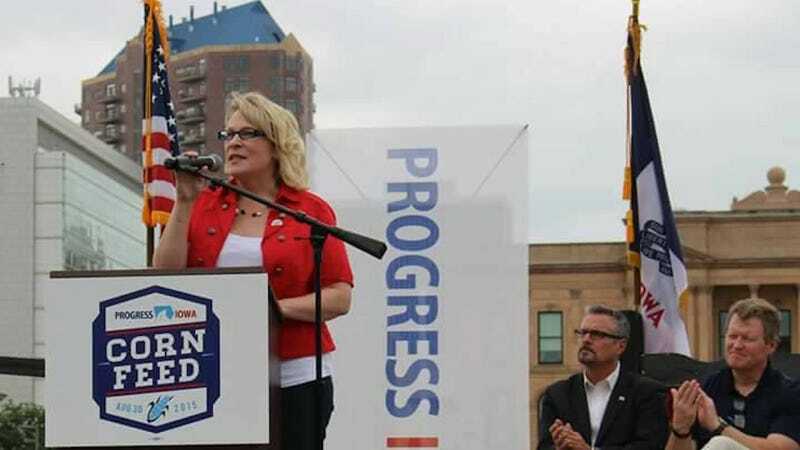 Kim Weaver, an Iowa Democrat competing with Republican incumbent Steve King for the state’s 4th Congressional District seat, is withdrawing due to threats against her safety. “Over the last several weeks, I have been evaluating personal circumstances along with the political climate regarding this campaign. After much deliberation, I have determined that the best decision for me is to ﻿withdraw my candidacy for the U.S. House race in Iowa’s 4th Congressional District. One consideration has been raised again by recent events at my home. Beginning during my 2016 campaign, I have received very alarming acts of intimidation, including death threats. While some may say enduring threats are just a part of running for office, my personal safety has increasingly become a concern. “Above this, my personal health is an issue. In order to sufficiently ﻿devote myself to the campaign, I would have to quit my job and shift to campaigning full-time. With recent legislation on health insurance, I must admit that the possibility of seeking a new job after the election exposes too much of a risk for me in not being able to secure health insurance. Weaver’s conundrum will sound achingly familiar to any woman who has struggled to balance her personal and professional obligations. It’s an overwhelmingly gender-specific problem—as are violent threats meant to intimidate and oppress. Meanwhile, Steve King, who dreams of an America “that’s just so homogeneous that we look a lot the same” has publicly discredited Weaver’s remarks regarding death threats. Note that in the photo below, Michelle Obama’s sign should read “Bring Back Our Girls” in support of the Nigerian schoolgirls who were kidnapped by Boko Haram. But a little photoshopping provided the racist, xenophobic touch Steve King admires.